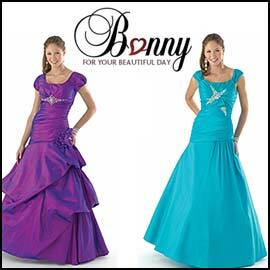 Bonny is a dress company that's been in business for more than a quarter century. If you've spent significant time shopping for prom dresses, it's likely that you've seen their prom label, Mystique. Click on the Mystique link on the website, and you can find a handful of gowns with modest cuts interspersed among the short dresses and the halter-style dresses. We saw some conservative dresses with short sleeves, some with cap sleeves, and some with shoulder straps that are cut wide, resembling sleeves. Curiously, the product descriptions were very short at the time of our visit, seemingly containing only the type of fabric used on each item, and the available colors. The site does offer an email address and a phone number so that you may contact the company and ask specific questions about the gown that catches your eye.